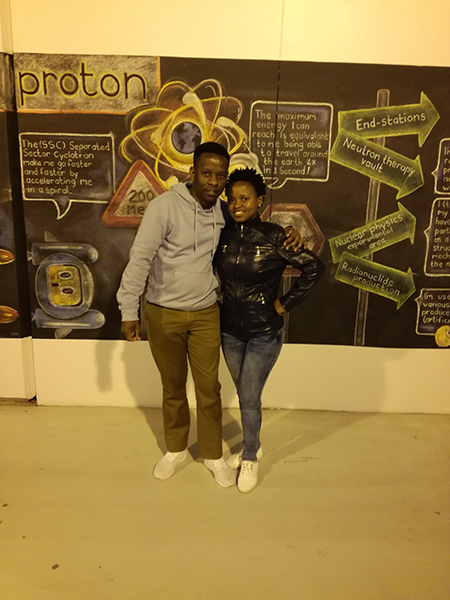 Two honours students at the North-West University’s (NWU’s) Centre for Applied Radiation Science and Technology, Koketso Kgorinyane and Pinkie Mereyotlhe, have been selected to visit Rosatom Nuclear Power Company in Russia for a week from 11 December 2017. They were among the top three African winners of the 2017 Rosatom student competition. Rosatom is the only company in the world able to offer the complete nuclear power cycle. This ranges from the nuclear fuel supply to nuclear power plant (NPP) construction and operation, and from nuclear medicine to reprocessing of spent fuel, as well as technologies for the safe storage of nuclear waste and finally the decommissioning of NPPs. The video could either be animated or filmed and had to be shared on YouTube. The two students made a video on the topic, “Debunking the myths around nuclear”. Their video was one of the top six in Africa and was then voted among the top three. Off to Rosatom in Russia are honours in nuclear radiation students Koketso Kgorinyane and Pinkie Mereotlhe.